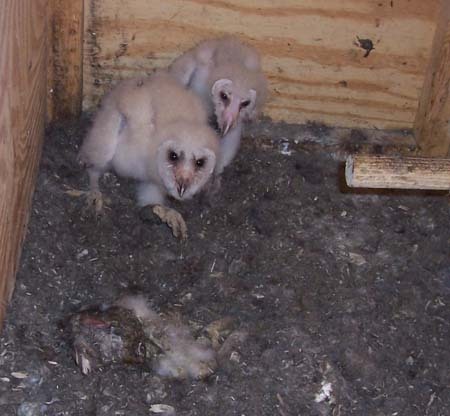 2010 was a less than spectacular year for our barn owls. The nesting behavior seemed normal, both adults survived and were present throughout the nesting, and there seemed to be no shortage of meadow voles. However, nesting mortality was extremely high. The photo at right shows the sole surviving nestling on the day it fledged. Of the clutch of five eggs, one failed to hatch, which is not unusual for any species. And, the first hatchling appeared rather small and less active than normal and died the first day. The next three nestlings to hatch appeared healthy and robust. Almost a month after hatching, a second nestling died, and 18 days later, a third died. Two weeks later, the one remaining nestling fledged. There seems to be no common denominator in the deaths of the three nestlings. Feb 12-March 10 - box not used for day roost. Any night visits were not monitored. March 20 - Two adults in box. 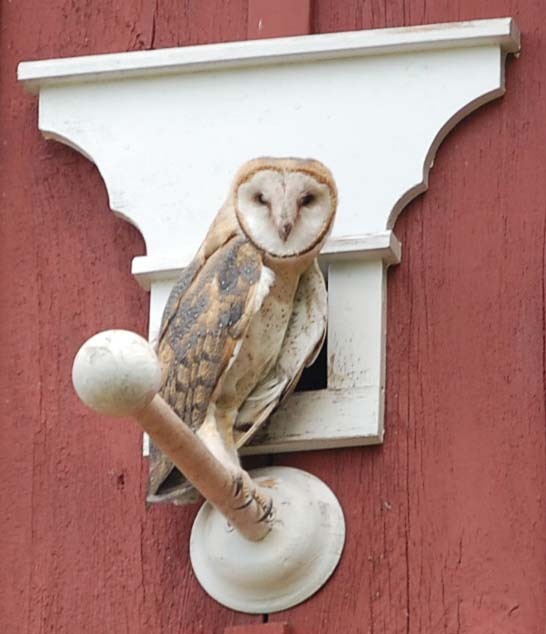 In following days, male was present on most days, female always used box as day roost. May 3 - 2nd egg hatched. 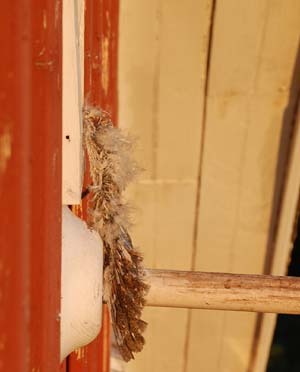 Nestling appears larger and more active than first hatch. June 3-June 19 - female back in nest box during day. 2 nestlings appear fine. June 20 - Smaller of two nestlings dead on floor of box. 11:30 am Female begins eating wing of dead nestling, including feathers. 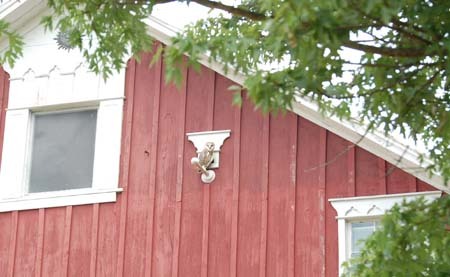 June 21 - Nestling carcass has been removed from box overnight and is draped over entrance perch. July 6 - Single nestling fledges. Was the event of June 20 cannibalism? One reason often cited for many birds of prey having asynchronous hatching is to allow the opportunity for older nestlings to dine on their younger siblings during times of famine. 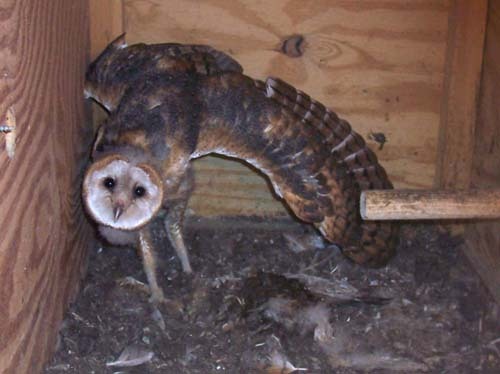 From an evolutionary standpoint, this makes perfect sense, but, I don't think I have yet witnessed this in our barn owl nestings. Judging from the available fresh vole carcasses in the nest box this year, I don't think this was a summer of famine for the owls. And, even when the female was observed eating the wing of the nestling carcass, it appeared that she was more interested in getting it out of the box than using it as a food source, especially when the carcass was ejected from the box that night. The next day the carcass was observed hanging from the entrance perch, having been shoved out of the box by one of the adults. Granted, there didn't appear to be much meat left on it.